Come home to the best city-living in Glendale, California. Minutes from Los Angeles, Camden Glendale offers studio, one, and two bedroom apartment homes featuring open concept floor plans with stainless steel appliances, quartz countertops, and wood-style flooring. Choose from a variety of amazing views; step out onto your private patio overlooking the city, facing the pool, or an awe-inspiring mountainscape. Entertain your neighbors and friends in the social lounge complete with gourmet kitchen or at our resort-style pool, fully equipped with gas BBQ cooking stations. Inside our e-Lounge, you'll always find a quiet place to get work done with fast internet speeds. Or you can hang out in any one of our multiple courtyards with comfy seating and water features. If you are looking to take it up a few levels, enjoy relaxing at one of our two sky decks with amazing city views. 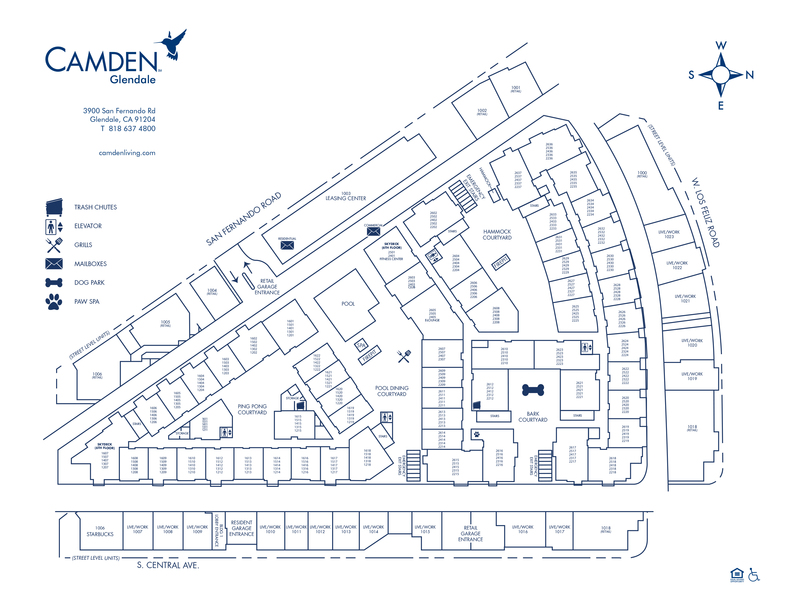 Camden Glendale is a pet-friendly community offering a fenced in, private dog park and even a pet-washing station. Parking in our underground garage is the perfect place to keep your car out of the elements and looking like new. We even have electric car charging stations for residents to use! Located in the heart of Glendale, within walking distance of shopping, dining, and entertainment, Camden Glendale is just a few miles from Atwater Village, where you can embrace your inner foodie at some of the best dining in one of Glendale’s trendiest neighborhoods. Positioned a few blocks from Glendale Galleria and only a few miles from L.A. Live, shopping and catching a concert or sporting event just got a whole lot easier. Get you fitness on and experience the great outdoors by enjoying the trails and scenic views of nearby Runyon Canyon and Griffith Parks. For your daily commute, Camden Glendale is just minutes from the 5 Fwy and the Amtrak/Metro Station. Residents receive a technology package included in the total monthly rent. This money-saving package includes high-speed internet up and WiFi plus over 300 digital channels including DVR. Residents also have access to the U-Verse mobile app on any smart device. Looking for more options? AT&T allows you to upgrade any of their services like internet speeds up to 300 Mbps and additional channel packages. Camden Glendale takes working from home to the next level. Our live work loft style apartment options are the perfect amount of space for someone who likes to work hard, but also likes to play. All of our live work spaces feature ground level storefronts for your small retail business or startup company needs. These double-entry floor plans are also perfect for someone who wants to live in style. Working from home is definitely not a requirement to live in one of these street-level apartments. Lease one and enjoy knowing that you have a unique apartment in Glendale. The good life in Glendale is waiting for you. Come home to Camden Glendale. We'll save a spot for you! We offer one to two covered parking spaces per apartment home with additional assigned parking available for $150 a month. Visitor parking is available in the retail parking garage.